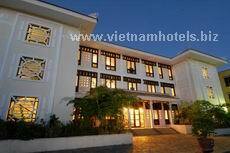 Villa Hue is a 12 room boutique hotel and practical training center for the youth from Hue Tourism School. The hotel is located in the center of the city giving it easy access to the beautiful Perfume River and all the cities main attractions. Guests will experience first hand service from the eager students of the school, some of who are experiencing working in a hotel environment for the first time. Superior Room - Our Superior rooms are well equipped and a spacious 36sqm. All rooms are twin bedded and feature : air conditioning, comfortable sitting area, mini bar and refrigerator, in room safety deposit box, satellite television, IDD telephone, hairdryer, slippers, wifi connection and tea coffee making facilities. Deluxe Room - Our Deluxe rooms are spacious at 38 sqm and feature a queen sized bed and a rich decor. All rooms feature : separate bath and shower, comfortable sitting area, mini bar and refrigerator, in room safety deposit box, satellite television, IDD telephone, hairdryer, bathrobe and slippers, wifi connection and tea coffee making facilities. Specializing in a fusion of favourite Vietnamese and Western dishes made with the freshest of local produce. Dishes are prepared by our students under the direct supervision of our Head Chef. Open for breakfast, lunch and dinner. The perfect place to relax and unwind with a cappuccino or espresso, delights from our pastry kitchen, an ice cold beer or let our students entice you with the cocktail of the day. If you prefer, drinks can also be taken in our beautiful internal courtyard. Our 114 sqm conference room can accommodate up to 75 people and has an abundance of natural light. We invite you to contact us directly to obtain our conference package prices. The hotel also has its own Private Dining Room which can be used for private meetings and dinners and can accommodate up to 25 people.